With an Ajrak draped over her abaya, the Pakhtu­n woman said she was celebr­ating the Cultur­e Day. KARACHI/HYDERABAD/SUKKUR: With an Ajrak draped over her abaya, the Pakhtun woman said she was celebrating the Culture Day because she identifies with the culture of the province ‘as much as any Sindhi does’. Parveen Khan was among the thousands of people who celebrated the 5,000-year-old embroidery and glasswork of Sindhi art and culture on Saturday. It was a kaleidoscope of deep reds and maroons and multi-coloured caps that twinkled in the sunlight across the province. In Karachi, Sindhis, Baloch and Pakhtuns took part in a massive rally arranged by the provincial culture department. The rally started at Regal Chowk. The stage-on-wheels was a giant Sindhi Topi, on which folk singers performed live. 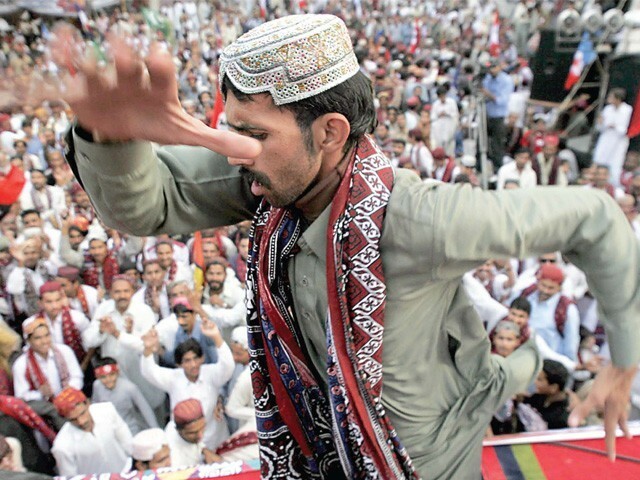 The jubilant crowd danced to famous folk songs, including Jeyan Sindh Wara Jeyan, Sindhi Topi Ajrak Wara Jeyan. Charged youngsters joined the rally on their silencer-less dirt bikes and expensive stone-studded caps. Men, women as well as party workers of the Pakistan Peoples Party turned up from all the four districts of the city to take part in the procession, that marched to the Karachi Press Club. Rafique, a cap vendor, said his complete stock of 150 caps lasted only a few hours as people bought the colourful headgear for themselves and their children. The vendor also brought a side stock of red ANP caps, of which he sold 70. The culture day was also celebrated at Muttahida Qaumi Movement (MQM) headquarters, where MQM Rabita Committee deputy convenor Anis Ahmed Qaim Khani said that the presence of thousands of people wearing Sindhi topi and ajrak on the streets of Nine Zero reflects the revolution, which MQM founder leader Altaf Hussain talks about. The crowd celebrating the day was diverse. The revellers also included Hindus, who came out onto the streets. Mukesh Kumar from Thar celebrated with his friends at Sea View. “It is our culture and we are going to keep in touch with it no matter how modern we become,” he said. Another young visitor at Park Towers, where different stalls of Sindhi artwork were set up, appreciated the exhibitions. “When we can have a valentine’s day and mother’s day, why not celebrate our much-prized culture as well,” she said. Awami National Party (ANP) supporters gathered at Fawara Chowk near Zainab Market. They marched to the Karachi Press Club under the supervision of party chief Shahi Syed. Talking to the rally, Shahi Syed said, “We have worked for Sindh and we will continue work for it.” Syed added that celebrating the culture day will help to wipe out the language-based politics in Sindh. The festivities took place amid high security with police and Rangers checkpoints along the length of Sea View. While this was a nuisance for cars, it kept traffic regulated for those celebrating in the service lane and slowly spilling on to the main road. But not everyone agreed with the logic of an exclusive day to mark the province’s culture. “It makes no sense to celebrate a day that may or may not be around when the next government comes in,” said a teenager identifying himself as Kashif. Meanwhile, some were there simply to enjoy themselves. “It’s good to get out and celebrate once in a while, we have so much going on politically, socially and the security situation is so unstable that we need a break from the everyday stress,” said Korangi resident Azfar. Students held rallies and marched across the city. All rallies ended at Radio Pakistan, Hyderabad. Young and old people alike danced and sang to the beat of drums and radios. Celebrations, however, were marred when some of the participants fired into the air. When police tried to intervene, the youngsters started to argue back. Cantonment police snatched a pistol from a young man and tried to arrest him, however participants of that rally fought back. The police ended up giving back the weapon as well. Meanwhile, 25-year-old Ali Hassan Abro was injured and later died in the firing of unidentified men during a rally in Jam Sahab tehsil in Benazirabad district. Despite the ban on displaying weapons, participants of most cultural processions were carrying and showing off their guns freely. “Today is our Eid,” said an enthusiastic Rizwan, who was taking part in the celebrations across the city. Representatives of several political parties and NGOs also took part. Ceremonies were held in the press club. Sukkur Press Club president Lala Asad Pathan said that all of Sindh was celebrating with great joy. Students in schools presented tableaus and other functions were also held across the province including Badin, Mirpurkhas, Sanghar, Tando Jam and Matiari. Cultural exhibitions held; chief minister to inaugurate official Sindhi encyclopedia. Liaquatabad riots : Why the power supply was suspended?